Jada, Julen er et forbigått stadium og juletreet samt julepynten er for lengst fjernet for i år, men – men jeg trenger fortsatt litt ekstra hvile ut etter strabasene. Særlig var kanskje Nyttårsaften tøff å komme igjennom, men – nå som alt ser ut til å ha roet seg igjen, men da det sto på som verst, så tok jeg meg en velfortjent pust i bakken – som her . . . ! Yes, the Christmas celebrations are finished! And the Christmas tree with all the rest of the stash have been removed! But I still need a bit of extra time to collect myself after all this! Especially was the New Years Eve a though thing to get through! But now, – when everything seems to have quitened down, I still feel the need to get myself an extra bit of shut-eye from time to time . . .! 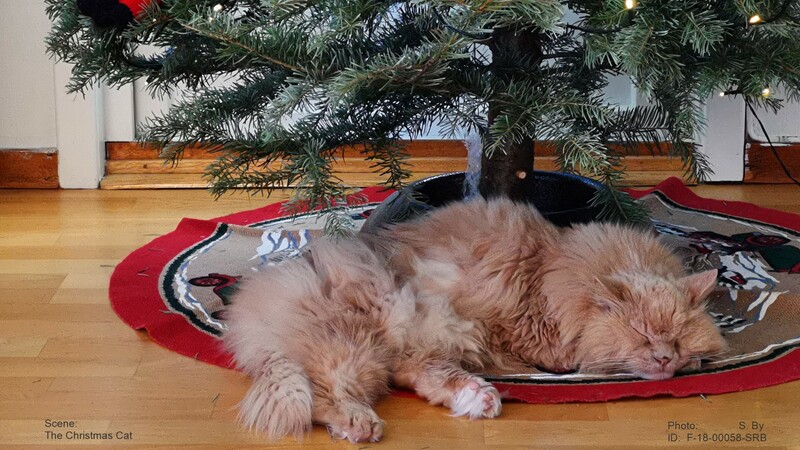 This entry was posted in BUSKERUD and tagged bilder, cat, celebrations, christmas, feiring, foto, images, Jul, katt, photo, søvn, sleep. Bookmark the permalink. Beautiful cat! Looks just like a cat I had a few years ago, they could be twins! Mine only lived 10 years, some kind of infection that wouldn’t heal. My cat weighed in at 16 lbs. Thanks for sharing the pic. You have it warm over there, cold here last week at -34F, colder with the wind. 5 – 10 below zero, however, we have experienced days with 20-25 below. That’s a bit too chilly for comfort. Awww, comfortable and cozy. Gorgeous cat and 2 years younger than our Amanda. Btw, keep your cold weather to yourself. We’ve got 20’s, with a chill factor in the teens, in Atlanta. Lucky you! Here there has been around minus 6 – 12 degrees C all week, but we are moving in the right direction! You should have seen him in his pride! Then – proud and fierce – he weighed in at 16 lbs! Today he’s old and frail; 15 years, and with a match weight at only 11 lbs. So cute, woow 15 years, lucky you. My Lucy cat died of 2 years. That was real young? Our last cat made 22 years! But – she didn’t manage to jump into the sofa in her last years . . .
Lucy died with water in the lungs, we don’t know what caused it; we could not save it!! It seems I’m getting my wish fulfilled, David? As global warming takes hold, there won’t be much snow in your parts of the world, and probably much less here as well?! Feel comfortable and cozy, both.